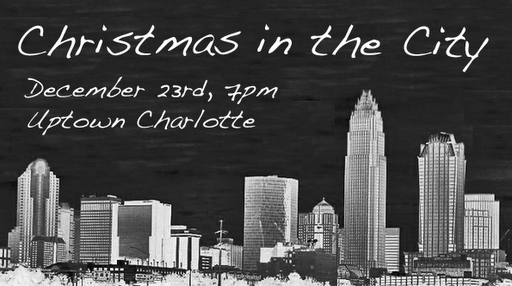 I want to personally invite anyone from the blogosphere to join us at 7pm tonight for Christmas in the City – a one hour candlelight Christmas service. We will be meeting at a beautiful, 100 year old church in the heart of Uptown Charlotte called Grace on Brevard. The venue is located between 3rd Street & 4th Street along Brevard Street (near the Time Warner Cable Arena). I would love for you to join us as we celebrate this Christmas and enjoy our final gathering of 2011 together! This is a perfect opportunity to bring a friend to hear the message of Jesus and share a memorable evening in our beautiful city. There is free parking starting at 6:30pm directly next to the venue. Click here for directions to Grace on Brevard.